White evangelicals overwhelmingly voted for Donald Trump in the 2016 election and were a key part of his constituency. As his presidency nears the 100-day mark, surveys conducted since Trump’s inauguration tell a similar story. Three-quarters of white evangelical Protestants approve of the way Trump is handling his job as president, according to a new analysis of Pew Research Center surveys conducted in February and April. This is nearly twice as high as the president’s approval rating with the general public (39%). Trump’s support from evangelicals is strongest among those who attend church regularly. Eight-in-ten white evangelical Protestants who attend church at least once a month approve of the way Trump is handling his job as president, including 67% who strongly approve of his job performance. White evangelical Protestants who attend church more sporadically approve of Trump’s job performance at a nearly comparable rate (71%), but they are significantly less likely than churchgoing evangelicals to strongly approve (54%). To be sure, most white evangelical Protestants have long been strongly supportive of Republicans. In the early days of the George W. Bush administration, fully 72% expressed approval of the way he was handling the responsibilities of being president, far exceeding Bush’s overall approval rating (54%). Surveys show, furthermore, that white evangelicals have grown even more likely to identify with the GOP in recent years. But during the 2016 campaign, some commentators expressed surprise at Trump’s support from white evangelicals, and suggested that his evangelical support might have come disproportionately from those who are not particularly religious – namely, those voters who described themselves as “born-again” or “evangelical” Christians but who, in practice, rarely attended religious services. Some commentators argued that parts of Trump’s rhetoric as well as his life story made him an unsuitable electoral choice for evangelicals. And, indeed, during the Republican primaries, highly observant white evangelical Protestants tended to favor Ted Cruz, while less-religious evangelicals backed Trump over any other candidate. But Trump’s current strong support from white evangelicals is consistent with their strong backing of him in the general election. In the months before Election Day, about three-quarters (77%) of white evangelical Protestant registered voters who attended church at least once or twice a month (including 78% of those who attended church weekly) said they would vote for Trump over Hillary Clinton. Among evangelicals who attend church less often, about two-thirds (67%) said they intended to cast their ballots for Trump. 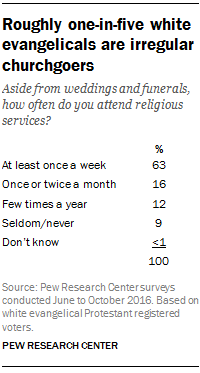 Surveys also find that white evangelicals who say they seldom go to church are a relatively small group. This fact alone serves to limit their electoral clout. Among white evangelical Protestant registered voters interviewed in 2016 Pew Research Center surveys, nearly eight-in-ten said they attended religious services at least monthly, including 63% who said they attended religious services at least once a week. Only about one-in-five self-identified white evangelical Protestant voters said they attended religious services either a few times a year (12%) or less often (9%). What about the connection between religious attendance and views of Trump within other large groups? Are less-religious members of other faiths more supportive of Trump than their more devout co-religionists? Here again, while there is limited available data (because of sample size limitations), the answer appears to be no. In general, within religious groups, those who attend services regularly and those who attend services less frequently express similar views of Trump. For example, half of white mainline Protestants who attend religious services at least monthly said during the campaign that they intended to vote for Trump (50%), as did 48% of white mainline Protestants who attend church less often. And among white Catholics – as with white evangelicals – those who attend religious services at least once or twice a month are more approving of Trump’s job performance than are white Catholics who attend Mass less often (61% vs. 44%).